The iconic SPECTRE ring, first seen in From Russia with Love in 1963, was updated for the latest 007 production SPECTRE. In the movie, the ring is worn by members of SPECTRE, including Marco Sciarra (Alessandro Cremona). Bond takes the ring from Sciarra and it plays a significant part in the story from then on. 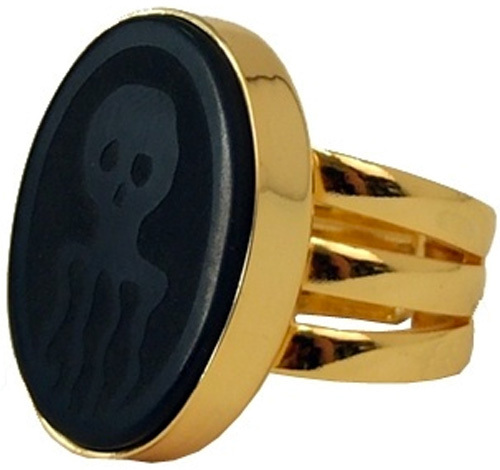 The original SPECTRE ring was gold with a black and quite large embossed logo (click on image on the right for larger version). The replica of this ring used to also be available at the 007 shop. SPECTRE Production Designer Dennis Gassner worked with Key Graphic Designer Laura Grant to create a more up-to-date version of the octopus logo bringing the ring into the 21st century. This was then produced by James Enright and his team at Propshop, the company that worked on many Bond films providing models and props. The replica rings are produced in exactly the same way as the on-screen versions. The concept design is 3D modelled embedding the famous octopus logo. This model is refined and 3D printed in wax. This is then cast in silver, art-worked and carefully finished by hand. The beautifully crafted silver ring is uniquely presented, emerging from the signature gun barrel graphic and its very own certificate of provenance. The ring is not available in the shop right now! What was the price of this ring before it sold out? It's a shame you can't select a ring size. Has anyone ordered? What size does the ring come in? There doesn't appear to be an option to select a size. I have received the ring but mine isn't displayed with its very own certificate of provenance. It's simply the ring inside the box. How about yours? I can confirm that: 1) It's impossible to choose the size of the ring. 2) I have contacted the 007 shop and they have sent me the certificate of provenance that has to be inside the box. If you haven't received it with the ring, contact them and they will send it to you asap for free.